How easy is my life when I remember that whatever I am going through is for Him and it is His Will? I have always longed for a companion who will not only remind me this purpose of our life, but also help me act upon it – showing me a way to implement this verse and most importantly, to uphold consistency in doing so. 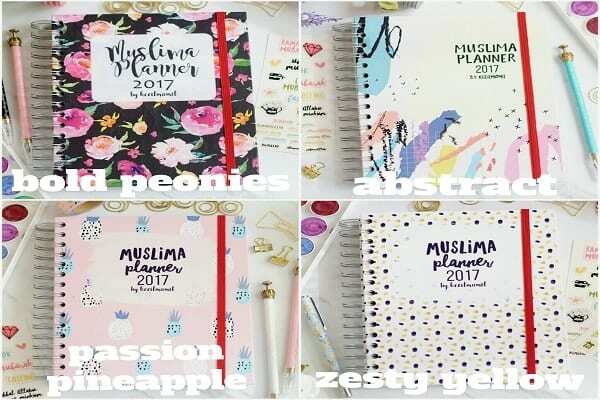 This is what I can promise you, in sha Allah, when you buy the Muslima Planner 2017 by Kecilmamil – it will help you organize and maintain consistency in your spiritual, professional and personal spheres of life. Every time I flip through its pages, I am mesmerized by the intellect and creativity behind this planner, masha Allah! 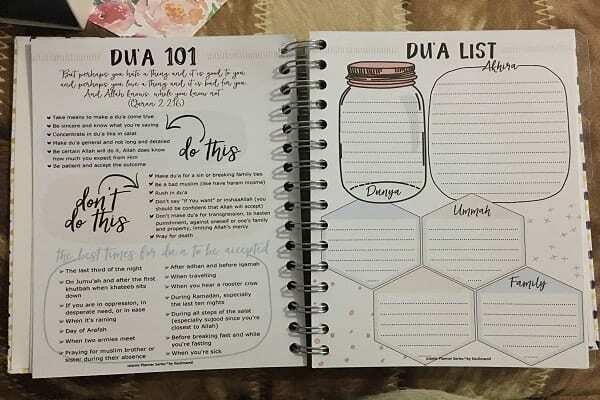 It is the experience, effort and interest of a striving Muslimah, Mia Widiasari, which made this an all-inclusive, efficacious productivity tool. Read on to find out my thoughts on this fantastic Productivity Tool. My diary arrived in beautiful floral wrapping paper, and was packaged very securely. I received the diary in the zesty yellow colour; my initial thoughts were that the diary is very sturdy, with an eye-catching design. The spiral binder makes it strong and ensures that pages won’t fall out easily as I intend to use it for the rest of the year in sha Allah. Although the planner is targeted at Muslim women, I do believe that the content of the planner makes it suitable for male users too. The planner would make a great gift for your wife, mother, sister or daughter in sha Allah. What hinders us from being consistent and productive? A vague/long to-do list, etc. Unfortunately, these are a few things which ease the work of Shaytan, the enemy of the mankind and aids him in making us sick spiritually and physically. 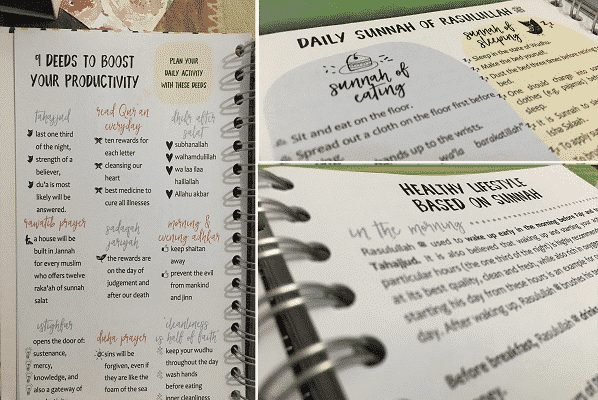 How can the Muslima Planner help us become a Productive Muslim? The layout makes the diary extremely functional. The space given for each week is enough for noting down the important tasks, with no space for a long list. This is one of the best qualities of this planner as it forces us to prioritize things. Tip: Enter your new year’s resolution, like joining a cause or learning something new, as a task for this month. This will help you organize yourself better to achieve it, rather than just having a vague idea which never progresses. With four pages dedicated to each month, the planner provides trackers for habit and exercise. With the help of this planner, we can develop 24 productive habits in a year! There is also room for goal box, to-do list, notes, etc in this monthly planner. 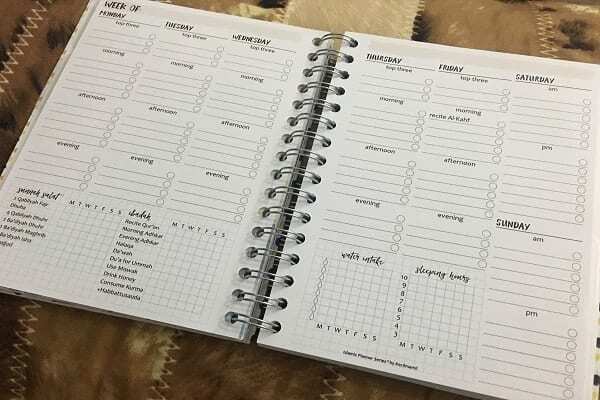 But, what I loved the most in this monthly planner is that the 13th, 14th, and 15th of each Hijri month is highlighted along with other important Islamic days. This not only helps remember to fast according to the sunnah but also helps identify the corresponding Hijri date of each day. Tip: Use it as a tracker for you and your spouse! Shade the half of the circles with one colour for you and the other half with another colour for your spouse. Developing habits or doing exercises together will strengthen your relationship as well as keep up your spirit. The most important feature of this weekly planner is that it forces us to prioritize our tasks for the day. There is a section to note down the ‘top three’ tasks of the day in addition to separate sections for morning, afternoon and evening. A great feature of the Muslima Planner is the tracker for water intake and sleep. We can draw graphs for our weekly water intake and sleeping hours in these trackers. The trackers are not limited to sleeping or water, and two more trackers are included for planning our days around ibadah. These trackers include sunnah salah, morning and evening dhikr, miswak etc. I would say however, it may have been more effective if English equivalents were given in the ibadah tracker for those who do not know Arabic words. Tip: Draw graphs for weekly water intake and sleeping hours in corresponding trackers rather than using checks. Memorizing a verse a day will take us 17 years, 7 months and 9 days! And, memorizing a page a day will take 1 year, 8 months and 12 days. 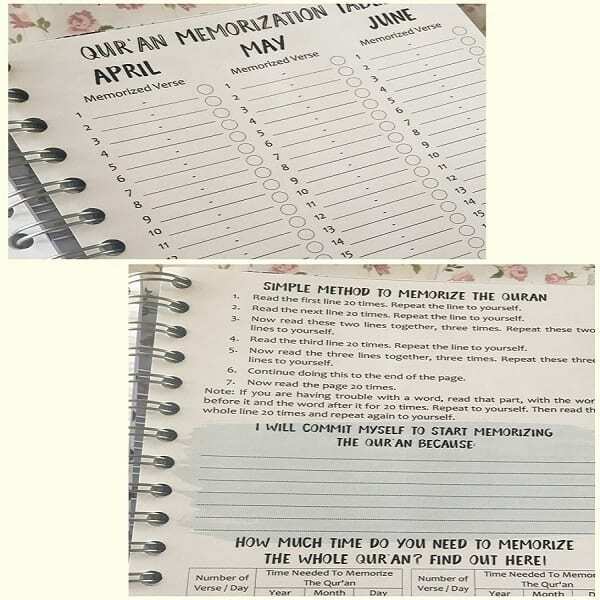 We can find out the time required to memorize the whole Qur’an from the Planner and can plan our learning accordingly using the Qur’an Memorization Table. Masha Allah, I really appreciate the wisdom shown by the designer in including an intention box. For doing anything, we have to purify our intentions continuously to save ourselves from riyaa’ (show off). Writing down our sincere intention and re-reading it can help us rid ourselves of riyaa’. Tip: Shade the circle half to indicate that you have memorized the verse(s) and shade the other half when you comprehend the meaning of the verse(s). 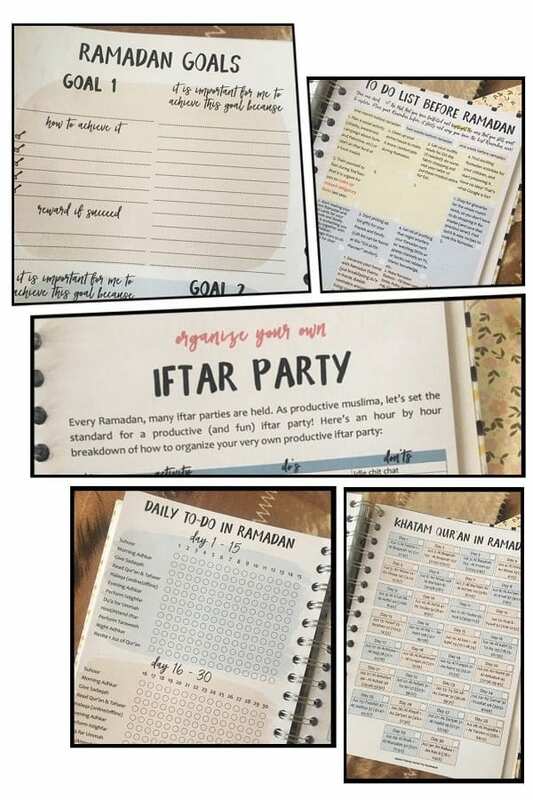 The Ramadan planner includes a Ramadan goals planner, to-do lists, Qur’an reading tracker, Ramadan Summary and Eid planner. What is truly admirable is that in the Ramadan Summary, there is a section for noting down the progress made in memorizing the Qur’an during Ramadan. While we focus on reciting Qur’an completely, we may delay our memorizing process. While using this section, we can reflect on our effort and adapt a pattern solely for Ramadan to memorize the Qur’an along with reading it. Tip: In one of the boxes given in the Ramadan Summary, put down your productive Ramadan lessons/reflections to act upon them later. The planner has dedicated a portion for learning about the sunnah. It details the daily actions of the Prophet and shows a healthy lifestyle based on the sunnah. The planner also presents 9 deeds to boost our productivity which can serve as a motivation for accomplishing tasks given in the ibadah tracker. For instance, it explains the benefits of reading Qur’an every day: ten hasanah (rewards) for each letter, cleansing our heart and best medicine to cure all diseases. Likewise, other deeds are precisely explained though do not stick to a single style. It would have been more productive if a pattern has been followed in the explanations. But, still, it is beneficial and I love it. 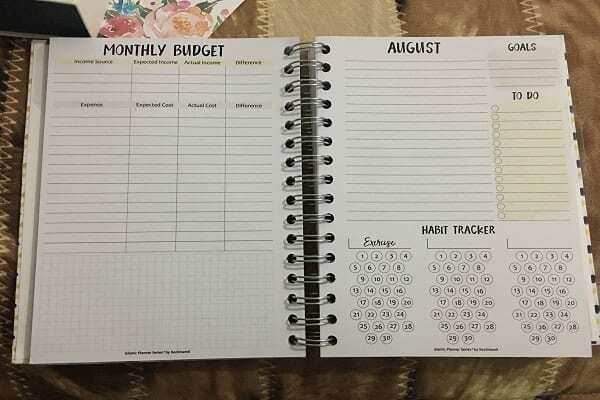 Tip: Choose a sunnah for a month and track it using one of the two habit trackers given in the monthly planner. What better inclusion than this: Life in dunya, life in akhirah, family and the ummah? The du’a list is designed to include our beloved ones and the entire ummah in our du’as. Want to pray for parents? Note down it in the family section. Forget to pray for Syria and Palestine? This du’a list reminds us to pray for our brothers and sisters in deen. Tip: Paste a sticker on the du’a section whenever you’re able to finish the du’a list during the best times for du’a to be accepted. 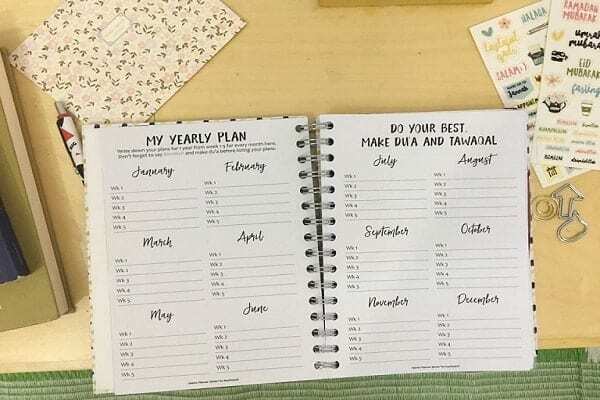 From monthly cycle log to billing tracker, a self-assessment section to beautiful dividers with Qur’an verses printed on them, the planner surely helps us become productive Muslimahs, aiding us make ourselves better, to make our relations stronger and assist our brains to remember more, in sha Allah…!!! Visit Kecilmamil Facebook page or their Etsy shop to place an order for your Muslima Planner 2017 today! Price: USD 24. For further inquiry, visit Kecilmamil.com. Remember to make du’a so that Allah will bless us to make the out of it. Do you use diaries and planners? 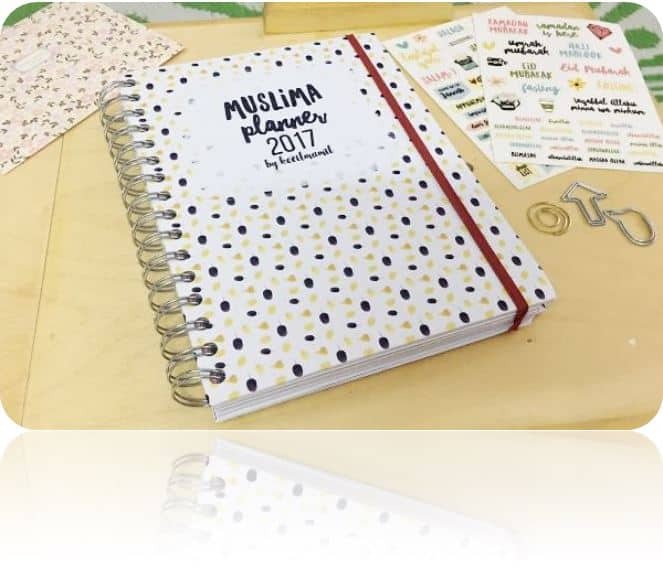 Did you use the Muslima Planner last year? How useful did you find it? Share it with us in the comments. Also, please let us know if this review was helpful. Mehjabin Abdurrazaque serves as the Content Coordinator at Productivemuslim.com. She holds a bachelor's degree in Physics and Education.